Making a second pot of coffee. Some days it's a second cup, and some days it's a second pot. Gotta do what you gotta do. Pairing busywork with an audiobook. You may not be able to read while you get work done, but you can listen to someone else read to you while you work. Shopping in the men's section for t-shirts. Take Forever 21 and their graphic tees for example. I can buy one from the men's section for $12. Or I can go over to the women's section and buy half of the same shirt (literally half...like, cut off before your belly button, half) for twice the money, because it was made for girls. No thank you! Bonus: The guys t-shirts are often pretty hilarious. Sometimes you it's worth it to give up sleep to get stuff on your to-do list done. And sometimes it's worth giving up getting stuff done to get some sleep. Give and take, people, give and take. There's not always going to be a clear right decision and a clear wrong decision. When this happens, you just have to trust your gut, even if it's terrifying to do so. Being happy is worth it. It's worth the hard work it may take to get there, and it's worth the things you may have to kick out of your life to make it happen. Life is short; be happy. I'm believing in embracing the warm weather and abandoning an afternoon or two at the gym in favor of taking in a baseball game or grabbing a beer at a brewery. Can't beat sunny & 80 degrees! I keep saying I need to try another audiobook again- I've only tried to listen once and I couldn't get into it /focus on the book. Also obsessed with the new look of your site! Um HIIII new site...I love Sara's work, my design is through her too, this is SO cheery! I will have to check out the Forever 21 men's section...I love a hilarious shirt or two...or five...thanks for the tip! I always listen to audiobooks when I'm filing papers or doing busywork at my job! Love this list!! I totally agree on giving up sleep. You can either stay up a bit longer to get things done or try to sleep and end up staying awake because of that long to-do list. Literally half. LOL. But seriously. Why is this a thing??? I like your new site, Chelsea! 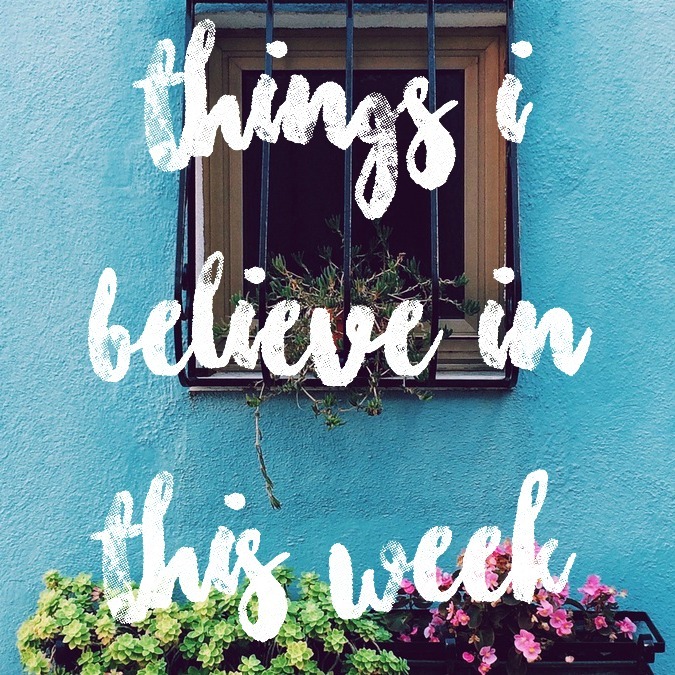 And I love all the things you're believing in this week! I think mine would be, "Sometimes it's nice to be alone, but sometimes you have to sacrifice that alone time to spend multiple evenings with family you don't get to see often." Love the new blog look! :) And I'm all about those men's graphic tees- I have snagged a couple of good ones at Target before and I like that they are longer!!! I never thought about shopping in the men's section of Forever 21! I just had an aha moment!! I love Forever 21 & am surprised with how durable their clothes are for the price! Thanks for the tip! I was listening to a few songs during some busy work earlier this week and it was great!! I am a fan of the male version of the graphic tee as well! Girl yes to that second pot of coffee! Needed! And there definitely isn't always going to be a right or wrong but that's kinda the beauty of life! What a great idea to getting shirts in the men's section... never occurred to me before! Oh hello pretty new blog design! It's lovely. And lately I am so there with you on the, 'believing in getting stuff done vs. getting more sleep issue'. Sometimes it's a balancing act for sure. Love this post and am totally with you on the whole second pot of coffee thing. Feels like this week is absolutely dragging! I love grabbing a t-shirt in the men's section every now and then - so comfy! Being happy is SO worth it! Also, I'm so obsessed with your new blog design! I'm all about the second pot of tea. Especially when listening to a podcast laying on the couch while drinking that second pot of tea. Your new blog design is amazing!! It's making me want a new design myself..
Shopping in the men's section for T-shirts is something I've never thought of before, but you're so right! They're cheaper and just as comfy and probably fit better - so thanks for the idea! I just love your posts! So uplifting & encouraging! I've noticed men's tees are so much softer too! I like stealing my husbands to sleep in, because they are so comfy! Your blog update is fun! I never thought to look for tees in the men's section. I'll have to check that out. I don't understand the 1/2 shirt thing either. That is definitely new since being back from Asia. Coffee all day long sometimes for no good reason! It's so good! Love this post! I also love pairing busywork with listening, but I listen to podcasts. Whenever I fold laundry or do dishes, I'm listening to something meaningful! I love this!! I always listen to a show or something while I work and it really is so nice! I think I just like having noise haha beats silence any day. I need to check out the men's section!!! Because as much as I love crop tops (nope) and paying twice the price (nope)... I want to see shirts you've gotten for inspiration! !